Syracuse University graduate students gathered outside Hendricks Chapel on Nov. 29 to speak out against the proposed Congressional Republican tax plan. Faculty, undergraduates, and graduate students alike gathered outside the chapel on the chilly Wednesday morning. A crowd of around 100 people was bursting with positivity and applause. If passed, the plan would eliminate the deduction for interest on student loans and categorize tuition benefits for employees and dependents as taxable income. If that tuition is categorized as taxable income, universities will no longer be able to waive graduation tuition in exchange for students’ work as teaching assistants and researchers. According to critics of the bill, this tax hike could deter future graduate students from applying to graduate school due to the rising costs and deduction for interest on student loans. Research could be limited if the university is no longer waiving students’ work as teaching assistants and researchers. This bill would also likely decrease socioeconomic and racial diversity at the graduate level of academia due to the increased barrier to entry. Gabriella Salkin at the rally. "If they tax our tuition, there’s no way I can afford to be here. This is my dream, my future." 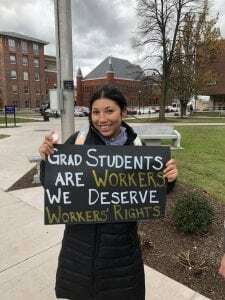 With a sign in hand, first year PhD student Rebecca Ellington said that as a first-generation graduate student, this rally was important for her. An email sent out Wednesday by Vice Chancellor Michele Wheatly and Associate Provost Peter A. Vanable said that the university opposes any tax measure that might “harm” graduate students and their families. The email said the university has been in contact with elected officials and advocacy groups regarding the proposed tax reform legislation. Poonam Argade, an international graduate student from India, said if the tax bill passes she would no longer be able to travel back and forth between home and school. “I would have no money to go home,” she said. Syracuse University isn’t the only college hosting protests opposing the tax plan. UCLA, USC, University of Pennsylvania and schools in New York City have been making recent headlines, with students protesting the House Republican tax plan. is a multimedia journalist pursuing a degree in Magazine Journalism at Syracuse University’s S.I. Newhouse School of Public Communications, with a minor in Information Management and Technology. In her free time, she enjoys reading, watching movies, and spending time with her cat, Tutu.